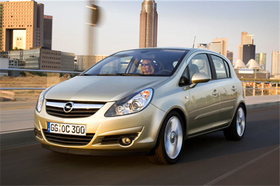 Opel workers say high demand for the Corsa should mean the company has a future. GM Europe union leaders are upbeat about the company's future ahead of a meeting next week to discuss cost-cutting measures that could include the closure of "several" of the U.S. automaker's European factories. GM has told its European division, which includes Opel in Germany, Vauxhall in the UK and Saab in Sweden, to reduce costs by $1.2 billion this year. It said cost cuts could include "several possible closures or spin offs of manufacturing facilities in high cost locations." Rudi Kennes, vice chairman of GM'S European Employee Federation, said the GM's announcement on Feb. 17 of possible factory closures was not as bad as expected because the company did not specify that factories definitely will close. "I am quite positive. The important thing was what GM did not say. They did not say that a plant has to close," Kennes told Automotive News Europe. Media reports have cited production sites in Belgium's Antwerp and Bochum in Germany as endangered, along with Saab's plant in Trollhattan. The employee federation, which represents 55,000 GM employees, will meet with GM Europe's management in Ruesselsheim, Germany, on Tuesday, February 24, for preliminary discussions about cost reductions. "This money can be saved without plant closures," Kennes said. "We will sit around the table and talk about it. We have to be creative. We need to make some reductions, but there are some other ways we can save money," he said. Kennes said there was now a time frame to achieve the cost reductions in a "socially acceptable and European way." GM has said it expects to resolve solvency issues for its European operations before March 31. It said a sustainable strategy for its European operations could include support from partnerships with the German and other European governments. Kennes said the unions will make it clear that they will not accept forced job cuts or plant closures. It is still unclear how many of GM's planned 26,000 job cuts outside the U.S. would be carried out in high-wage western Europe, where the carmaker employs about 50,000. Many GM Europe workers reacted angrily to the carmaker's cost-cutting plans and some repeated union calls for Opel and Vauxhall to be separated from General Motors. "Opel makes a profit. Nobody on the outside knows that, they just always think that since the parent is falling apart that Opel is also rubbish," said Francisco Jimenez, an Opel worker and IG Metall union official in Ruesselsheim. "We sell our cars. People are interested in our models - you have to wait three months for a Corsa." One worker at Opel's Antwerp, Belgium, factory said: "People are very concerned about their jobs, they want to know what is going to happen. At the moment no one is answering our questions." "I think we should separate from GM. In the last few years we have made a little bit of a profit, but the profit went to the U.S. to fill their debts." GM is seeking an additional $16.6 billion from the U.S. government to help it survive the global economic crisis after already getting $17.4 billion in loans.